Hi friends! Dana Tatar here today sharing a fun Spring home décor project. 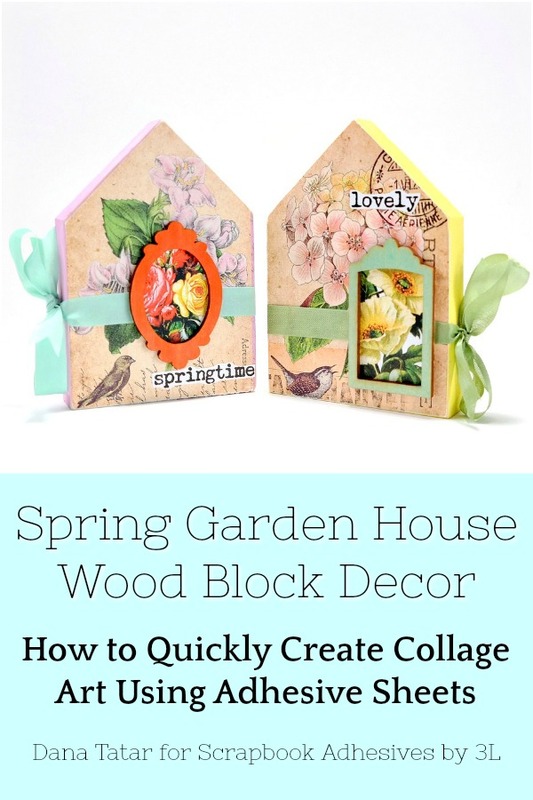 I started this project with a wood block house kit, which included wood houses, collage sheets, and embellishments. I used a 12×12 Adhesive Sheet and Crafty Power Tape to quickly assemble this craft. This colorful Spring décor makes me so happy! 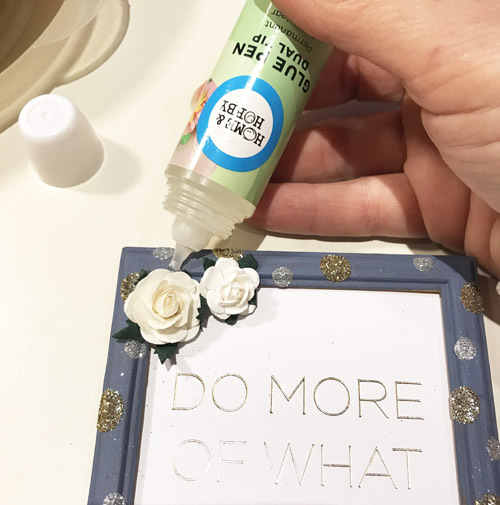 The selection of products I used allowed me to apply incredibly strong, clear, edge-to-edge adhesive to achieve the look of decoupage art without the mess and drying time. 1. 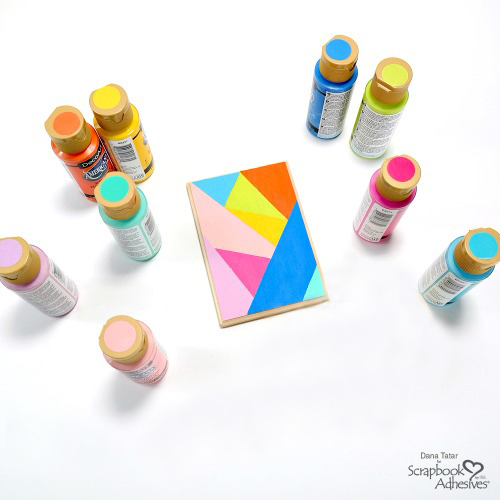 Apply bright colors of acrylic paint and watercolors to wood block houses and wood veneer frames. 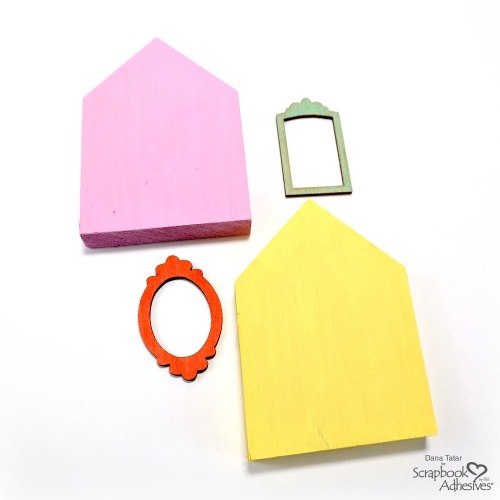 Be sure to apply paint to the back, sides, and front edges of the wood block houses. Let dry. 2. 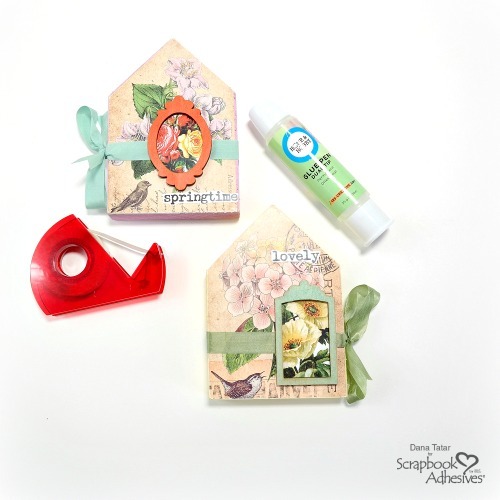 Place the wood block houses on the edge of a 12×12 Adhesive Sheet. Then, use a pencil to trace around the shapes. 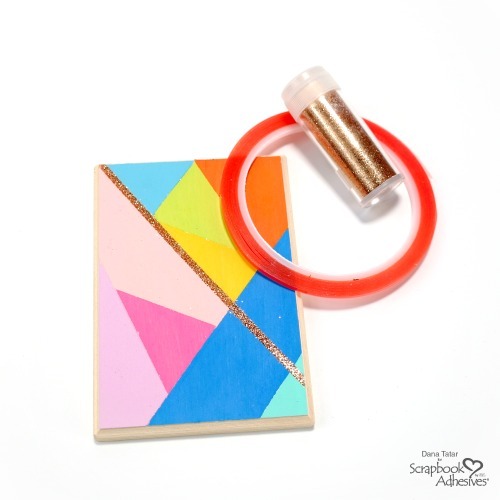 Next, use scissors to cut out portions of the Adhesive Sheet to fit the wood blocks. 3. 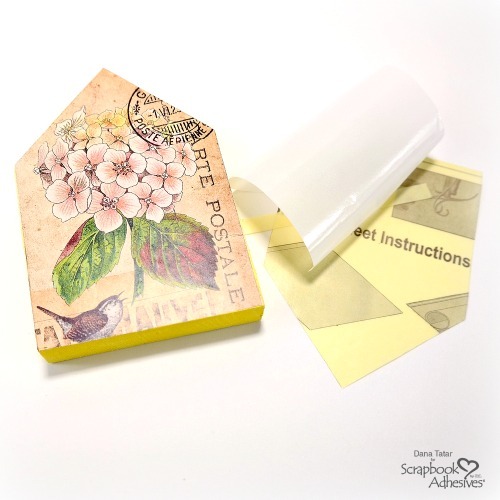 Remove the small strip of yellow backing paper and place the exposed adhesive onto the bottom edge of the garden block. Next, remove the larger yellow backing piece and smooth the adhesive onto the wood. Repeat this process for the second block. 4. Cut two garden collage sheets to fit the wood blocks. Then, align the paper onto adhesive. 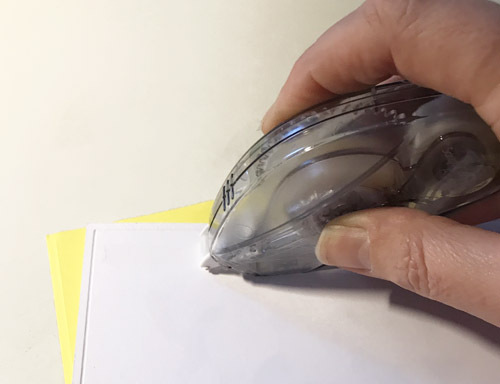 Press firmly to smooth the paper onto the adhesive. Repeat for the second block. 5. 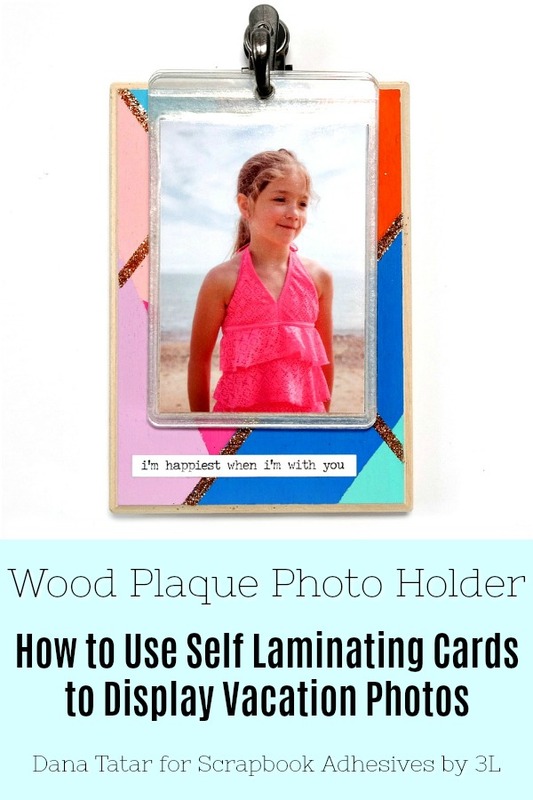 Apply glue to the back of two wood veneer frames. 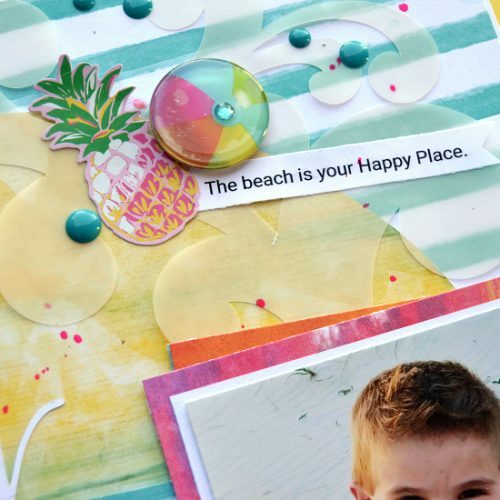 Press the frames onto garden collage images and let dry. Cut away the excess paper. 6. 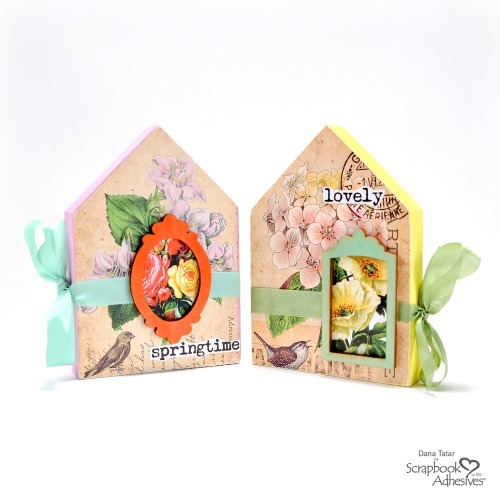 Use Crafty Power Tape to adhere ribbon and the decorated frames to the garden blocks. Use a Dual Tip Glue Pen to apply clipart words to the block houses. These garden houses would look great on a bookshelf, side table, or in a centerpiece. Where would you put them? 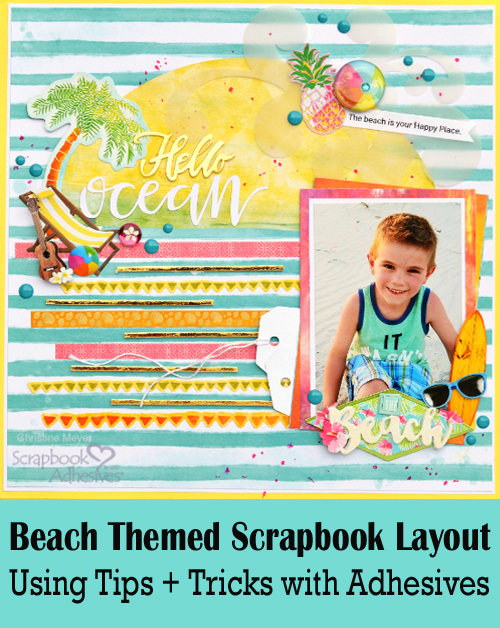 Keep reading to see how to win some awesome prizes from Scrapbook Adhesives by 3L! Do you know that March is National Craft Month? 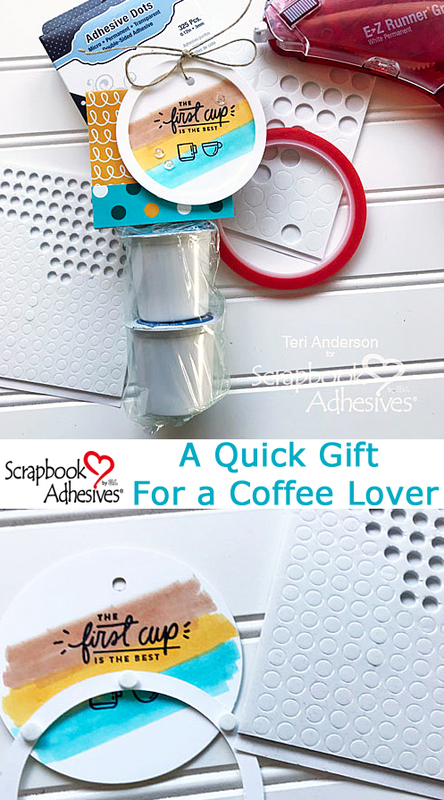 We’re partnering all month with FaveCrafts and sponsoring two great adhesive prizes! There are new tutorials every day, with daily prizes plus a grand prize! Don’t wait too long, this one ends Sunday, March 31st, 2019, at 11:59 pm EST. Click here for all the details and enter to win! 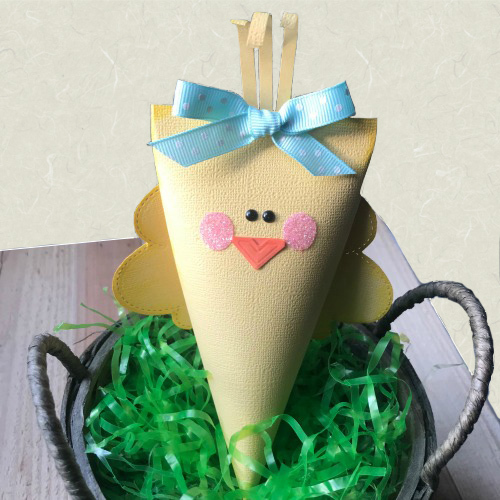 For entry details CLICK: National Craft Month 2019 with FaveCrafts. 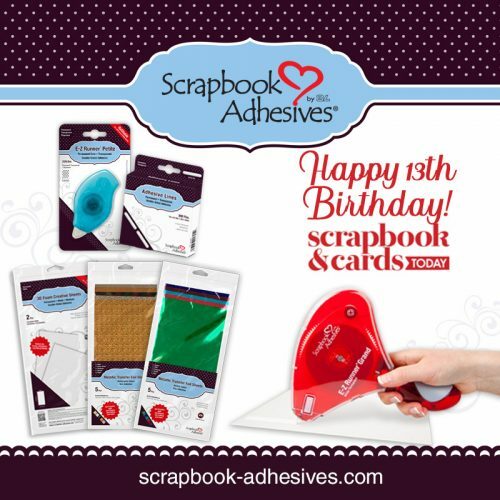 Our friends at Scrapbook and Cards Today Magazine are celebrating 13 years of free inspiration in their downloadable magazine! We are honored to celebrate this milestone with a fun birthday giveaway! Click to visit the blog post with all the details! 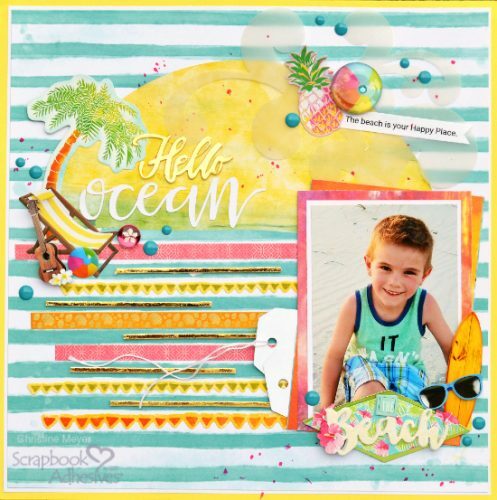 To see inspiration and enter to win CLICK Here: Scrapbook and Cards Today’s 13th Birthday Celebration! 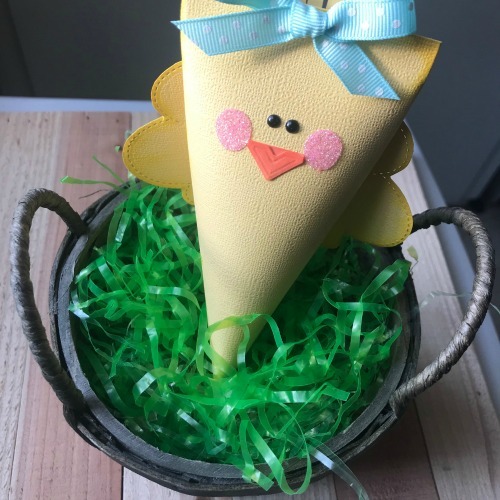 This contest ends on Thursday, April 4th, 2019, at 11:59pm EST. Hello everyone! It’s Judy here today. 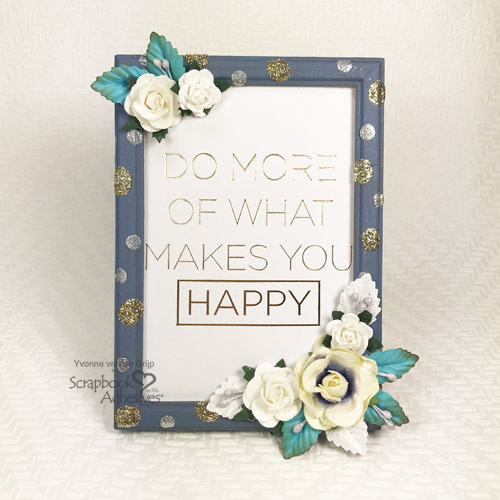 I have a card with a Framed Butterfly and Flowers using 3D Foam Frames. 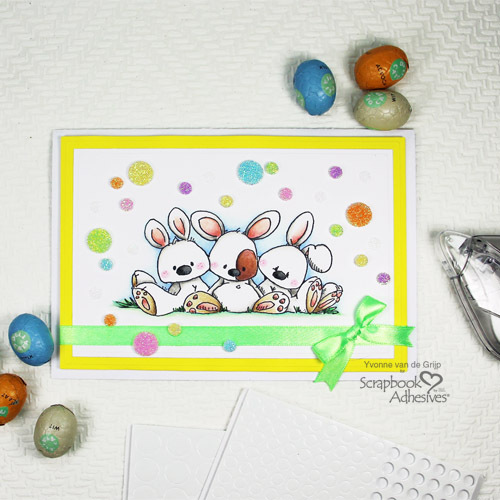 It’s a quick way to add a dimensional frame to a card. For the background, stamp a script across tan cardstock. Then place a 3D Foam Frame over it. I used a ruler to align it straight. Lightly position the frame over the image, then center it and adjust spacing at top, sides and finish at the bottom. Be careful not to stretch it as the paper may curl. 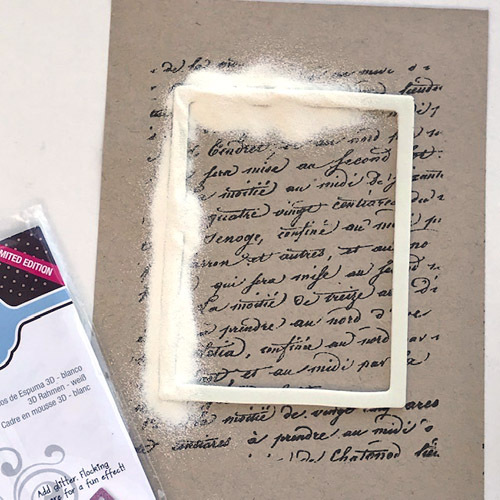 After removing the top liner, cover the 3D Foam Frame with white embossing powder and heat emboss it. I really like the enamel-like finish it creates! Blue Distress Oxide ink works great as a watercolor inside the frame. Around the outside, I brushed on white gesso mixed with water for a wash of color but not opaque coverage. I placed a ruler along each edge and tore some paper off. The flowers are all die cut from tan paper and colored with Distress Oxide inks. Arrange them in the frame and snip the stems to fit. All except orange flower are fastened with the Dual Tip Glue Pen. The orange flower has a 3D Foam Square under it to pop it up with stems glued at the bottom. 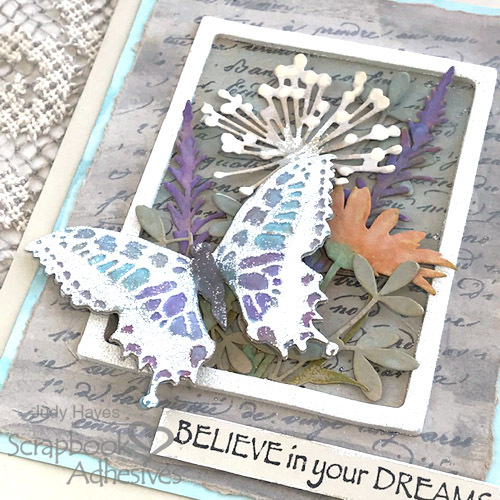 Now you can cut and emboss the butterfly from same tan cardstock. 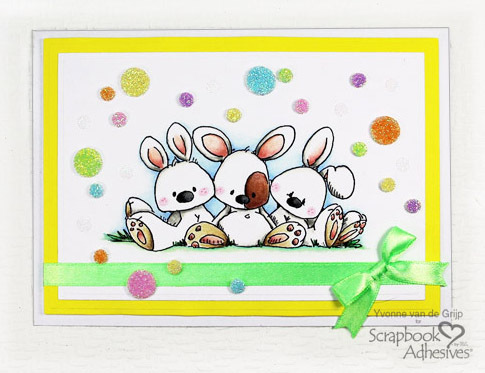 I rubbed embossing ink over the raised areas, added white embossing powder, and heat embossed it. Then I added color with Distress Oxide inks used as watercolor. 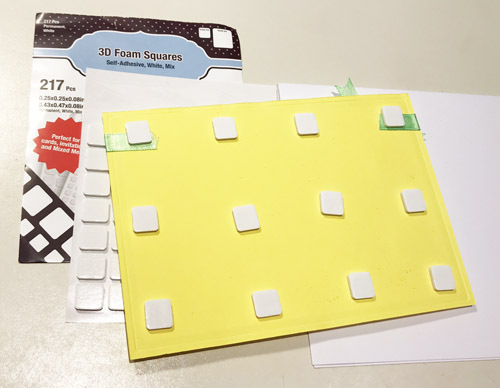 It’s popped up on the card with 3D Foam Squares. I stacked one under the body and two under the wings. 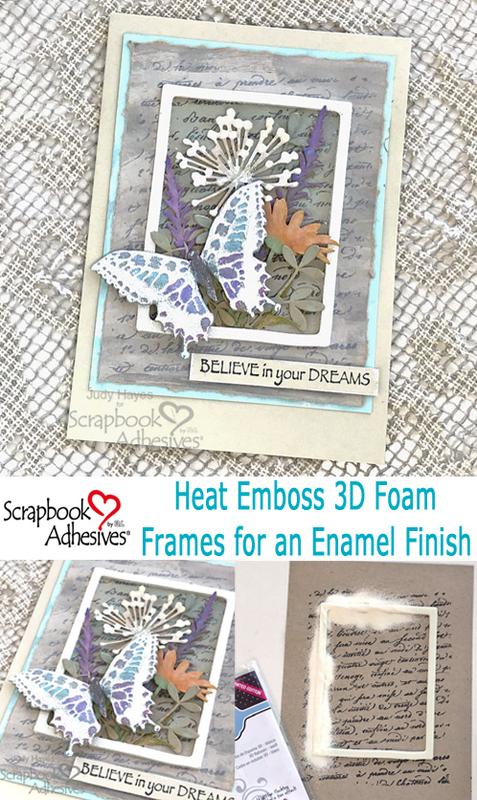 Finally, assemble the framed butterfly layer onto an aqua mat using E-Z Runner® Ultra Strong Refillable Dispenser. I use Ultra Strong because the paper was warped a bit from painting it. 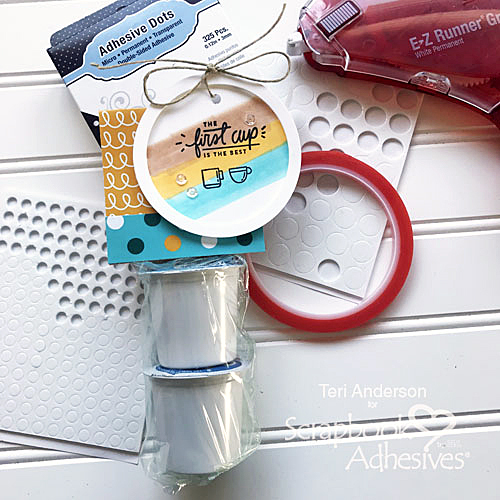 The E-Z Runner® Ultra Strong adhesive is a super strong and immediately tacky adhesive, and it holds the paper in place! 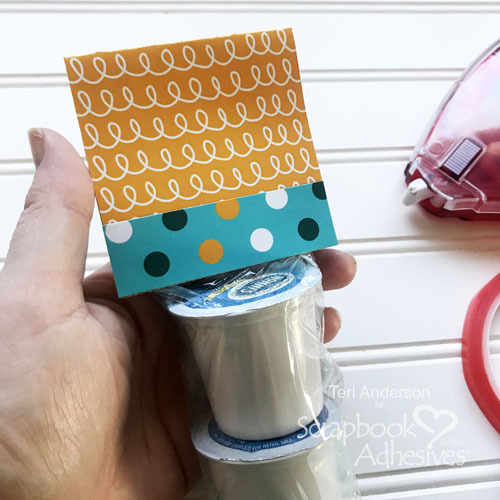 That layer is fastened to a 5 x 7-inch card with E-Z Dots® Permanent Refillable Dispenser with a bit of Ultra adhesive at the corners. I like to do that to be sure the corners stay in place! 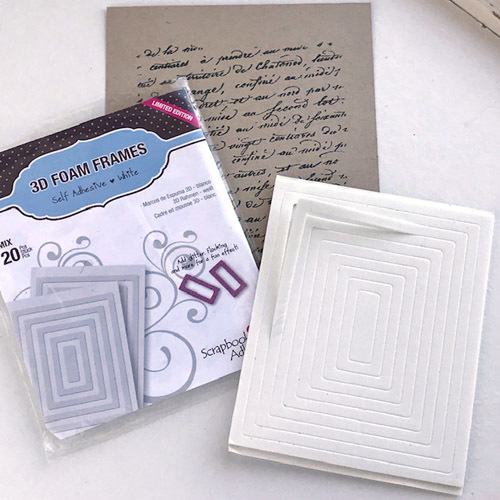 Fasten the verse strip with Thin 3D Foam Squares for just a bit of dimension. 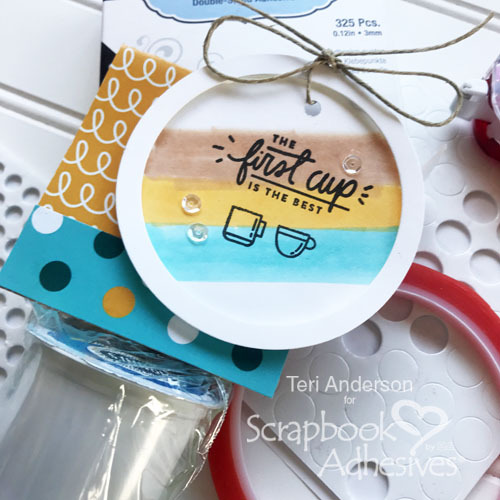 To make a gift tag, first cut a large circle from cardstock. 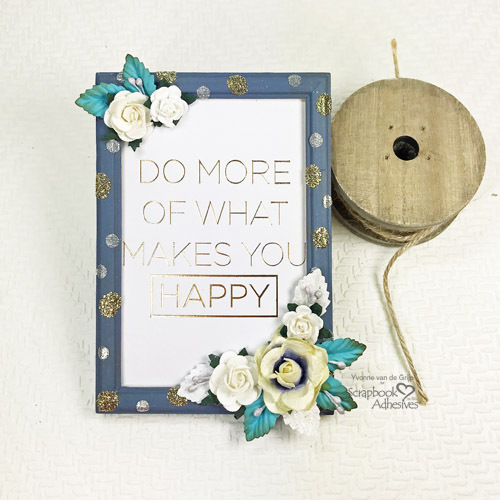 Cut a large circle frame from cardstock as well. 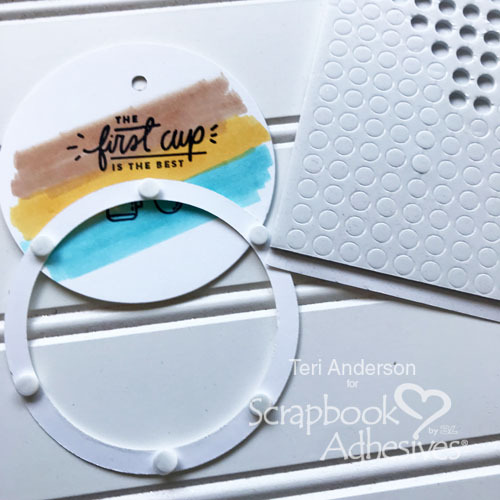 If you don’t have a circle frame die, line up two circles on cardstock and run the dies through a die-cutting machine to create your own circle frame. 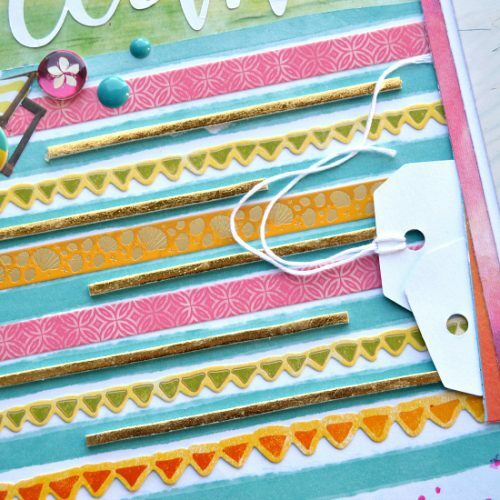 Scribble some stripes onto the cardstock circle with markers. Don’t worry if your lines are perfect! Wobbly lines are just fine for this project. 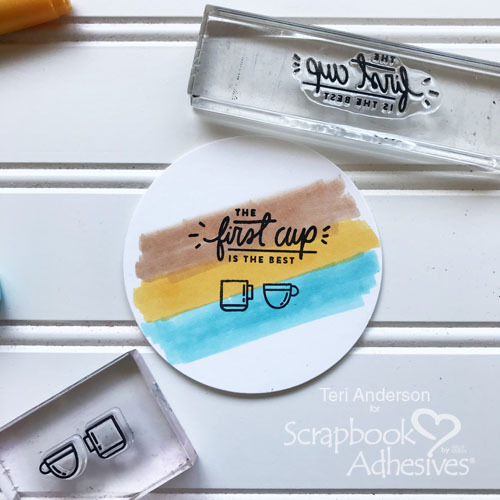 Stamp sentiment and a couple of coffee cups with black ink onto the circle. Set the circle frame onto the circle and poke a small hole through the top of the circle. Now set the large circle aside. 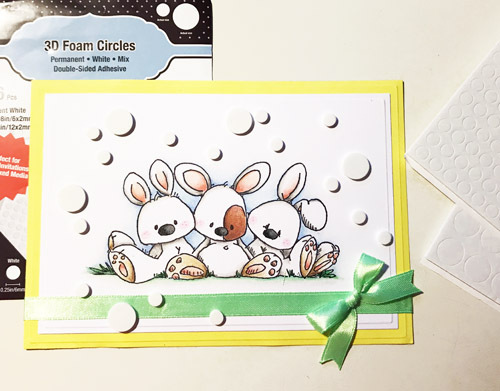 Place several small 3D Foam Circles on the backside of the circle frame. Adhere it to the circle. Set the tag aside. Let’s work on the gift with two coffee pods. Place them a plastic sandwich bag. Adhere a line of Extreme Double-Sided Tape along one of the bag’s outside edges. Leaving the bag open, roll the bag so the coffee pods are nice and tight. Close the top of the bag. 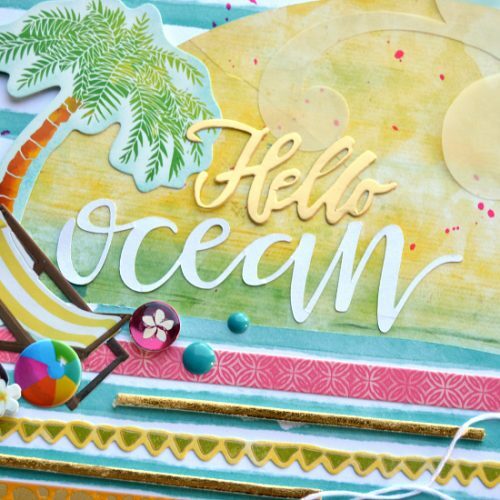 Cut a 3″ x 6″ piece of patterned paper. Fold it in half. 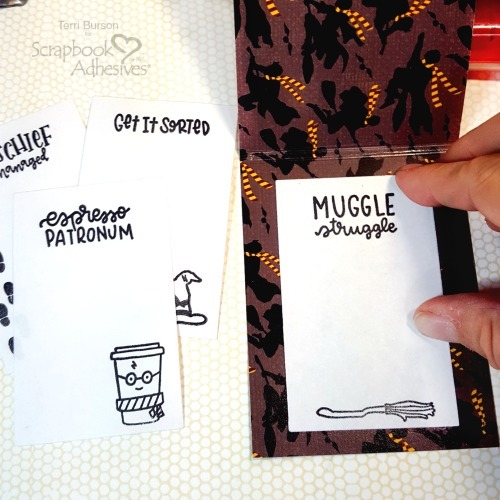 Place a strip of patterned paper across the front of it. 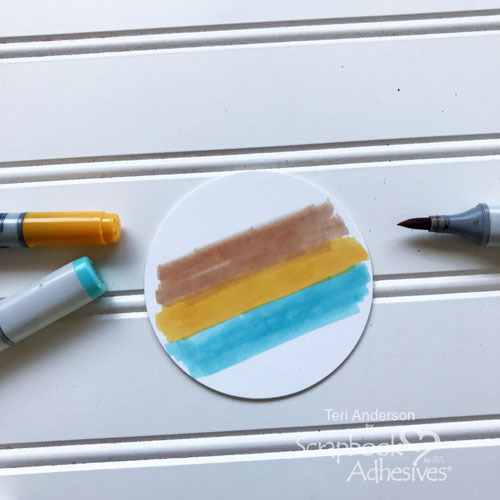 Place several strips of Extreme Double-Sided Tape on the backside of your 3 x 6″ paper panel. I recommend putting some at an angle. Place the top of the bag on the tape. Fold the paper panel over the bag. 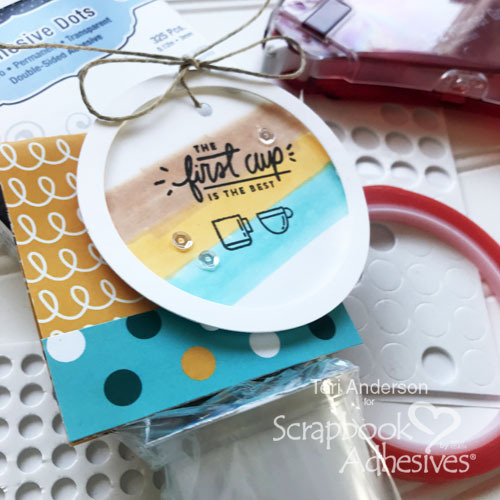 Finish the gift by adding some twine or jute to the gift tag. 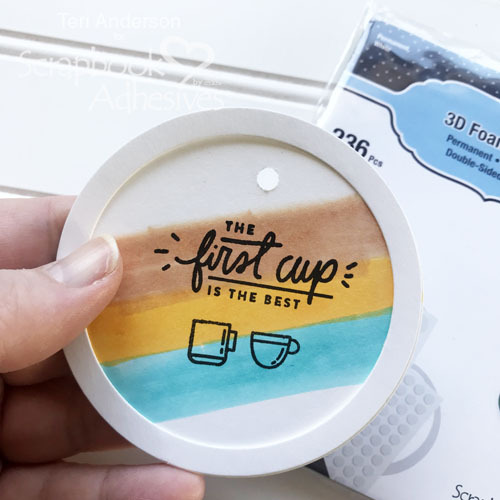 Tie the tag onto the package of coffee pods or adhere it with 3D Foam Circles or Crafty Foam Tape. If your jute isn’t even, use Adhesive Dots to anchor the jute in place. 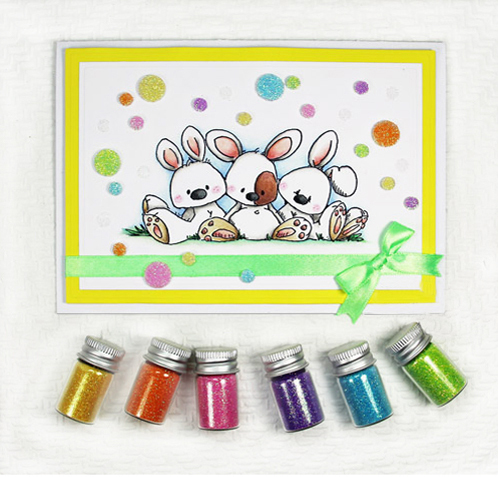 Want to add a bit of glitz to your gift? 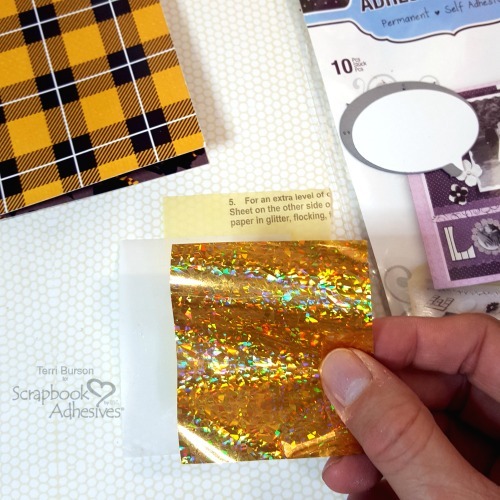 Adhere a couple of sequins to the tag with Adhesive Dots. 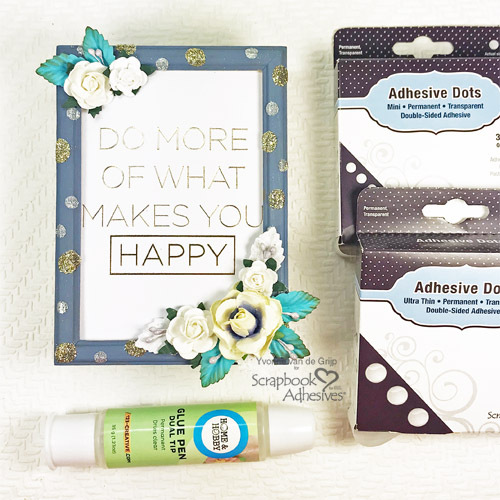 I find the Micro Adhesive Dots are the perfect size for placing sequins on my paper craft projects. 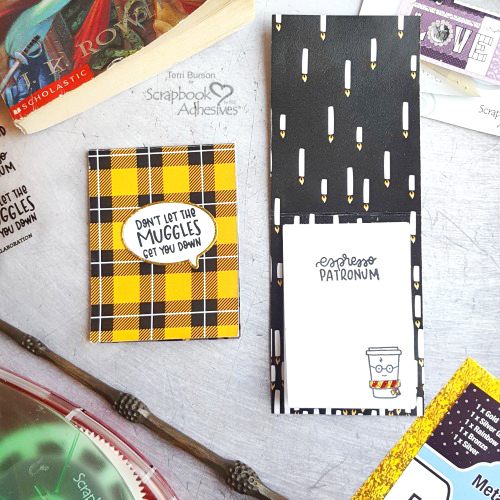 Hello friends, Terri here with creative tips for making these Wizard DIY Sticky Note Pads. 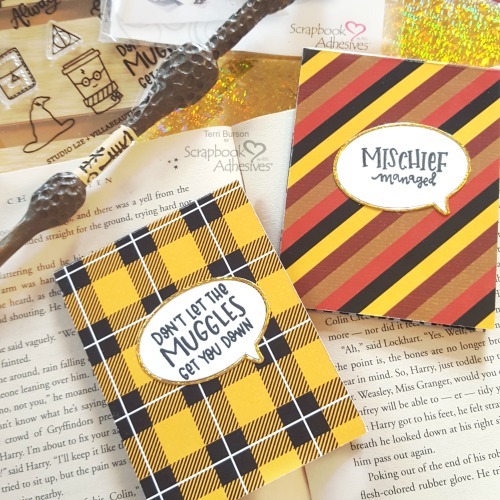 We all have Harry Potter fans in our life and these would be great for gifting to your Wizard loving co-workers, friends, and family. Let’s get started! 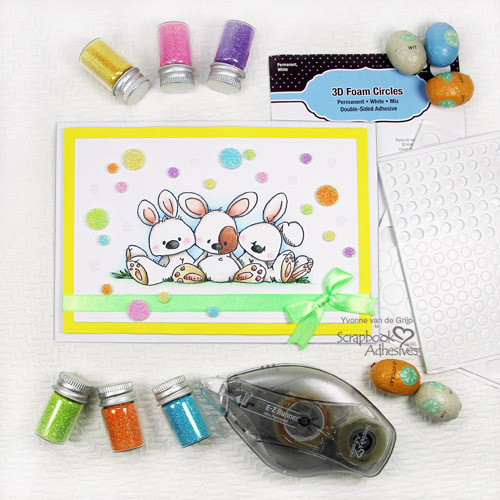 To embellish the front of my booklet, I’m using a bubble chat die with a stamped sentiment. The die actually cuts a separate thin outer ring, which I intend to foil, using the new gold foil from the Metallic Transfer Foil Sheets Holographic. 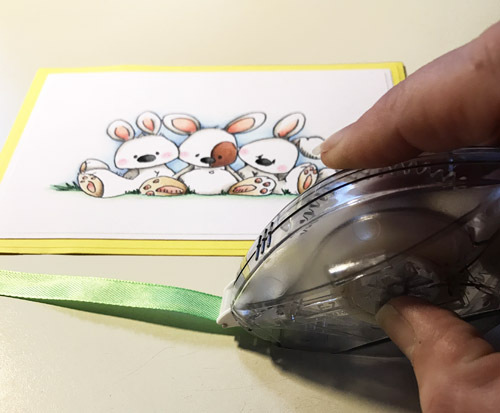 To easily foil, trim a piece of card stock large enough for the bubble die. Trim two sections from the Adhesive Sheets 4×6 inch. 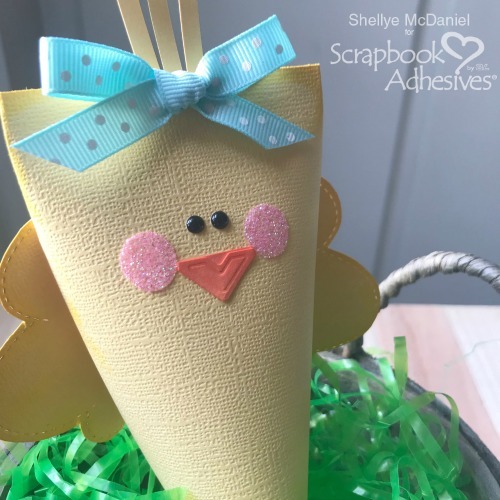 Peel the top yellow layer and apply an adhesive sheet to cardstock. Apply foil and rub in. 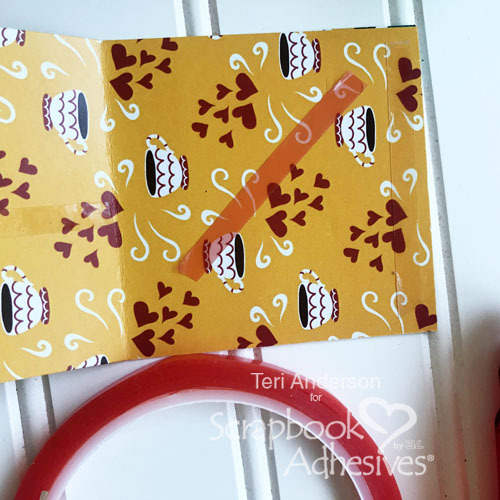 Peel the second piece of adhesive sheet and apply adhesive to back of the cardstock. Do not remove the backing until after running the foiled cardstock and die through your manual die cut machine. 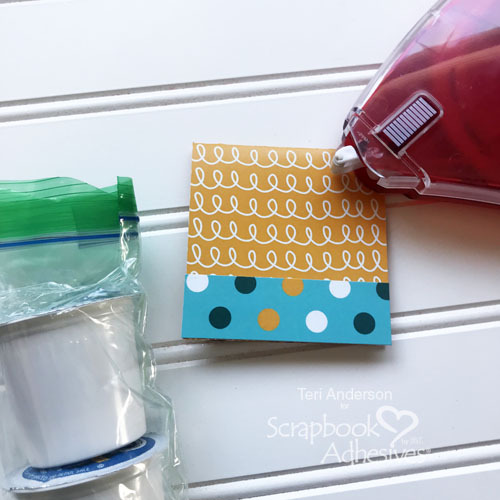 For this next step, I’m using planner stamps, black ink, and a small acrylic block. First, I trimmed some plain white computer paper, enough to make 20 sheets sized at 3 1/2 x 2 1/2 inches. Four sheets of computer paper are sufficient for trimming 20 sheets. 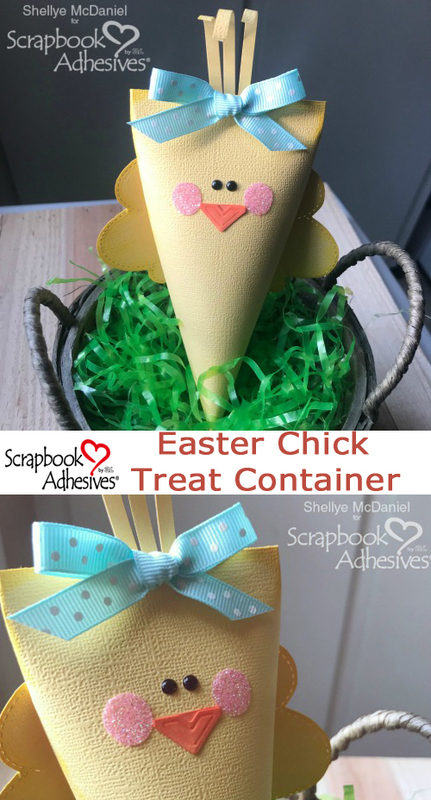 You can also use a rectangle die and stack at least 5 sections of paper at a time, to speed up the cutting process with a manual die cut machine. 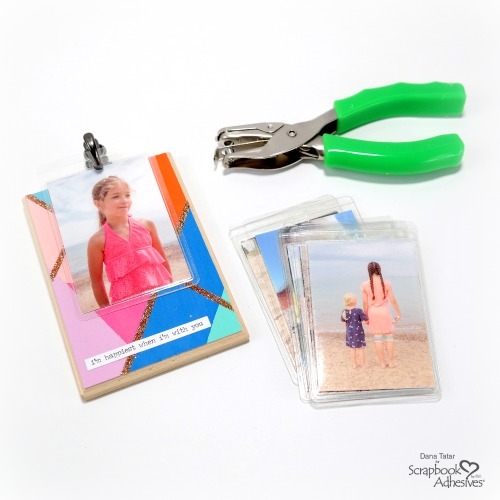 You can also stack and trim with a paper trimmer. 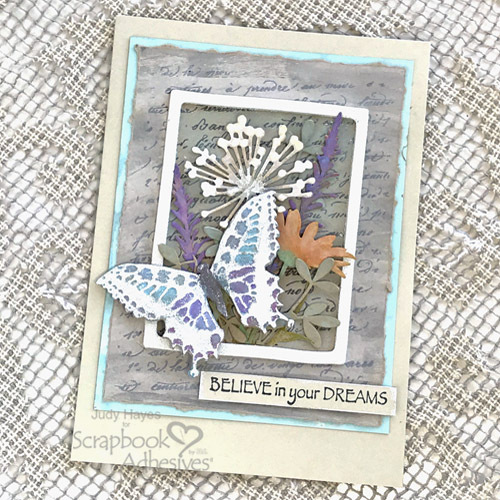 Using an acrylic block makes quick work of assembly line stamping, using the same stamp for 5 sheets, then switching out stamps for the next 5 sheets, and so on. 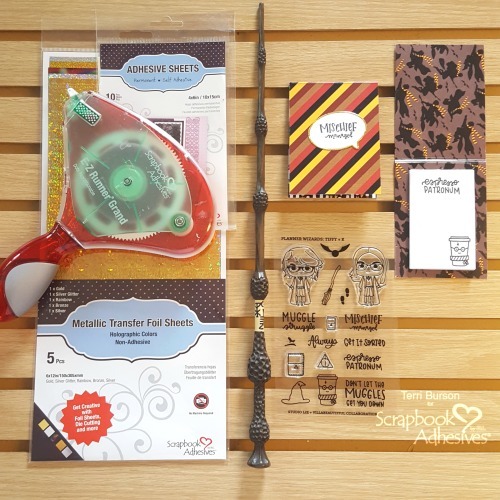 Designer’s Tip: When using clear photopolymer stamps, they need to be conditioned for the first use. Rub the stamp across the back of your hand or arm. The oils from your skin will help condition the stamp and allow the ink to fully adhere. 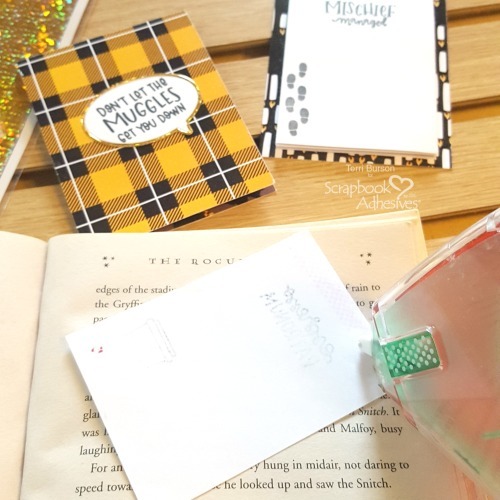 When you want to make your own Wizarding DIY Sticky Note Pads, you will need to go for the green. 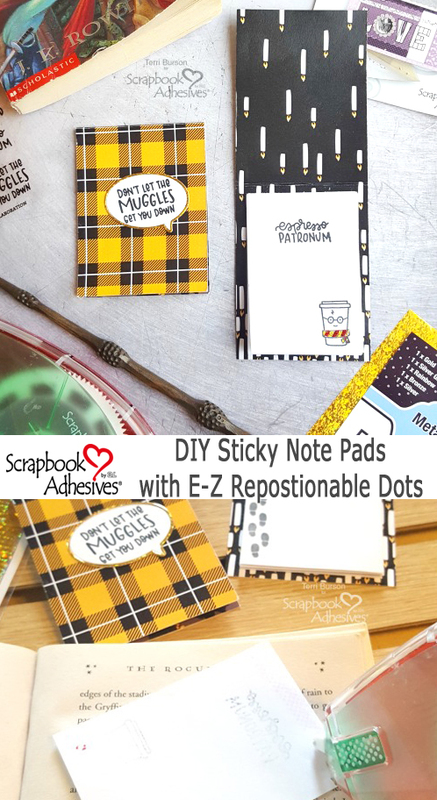 Yes, the E-Z Runner® Grand Repositionable Dots Refill is my go-to cartridge for non-permanent adhesive. Just pop it into the E-Z Runner® Grand Refillable Dispenser and you are good to go. One word of advice, though. 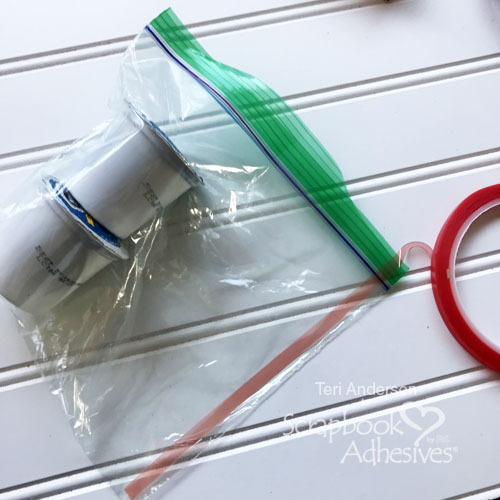 The adhesives I mentioned above are exactly what you need to run across the back top portion of your DIY notes. 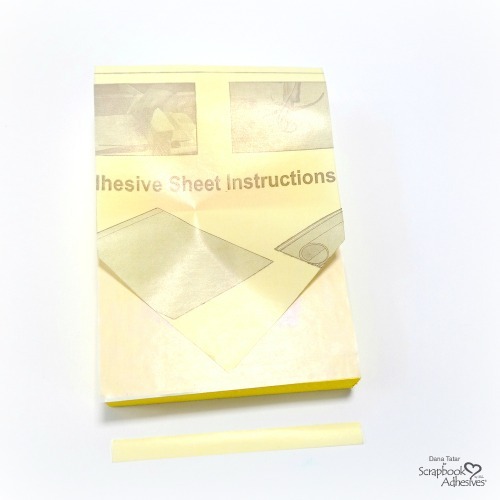 However, the very first paper note that you adhere to your booklet needs a sturdier adhesive. It’s the key to holding everything else in place. Swap out your cartridge for the E-Z Runner® Grand Ultra Strong Refill, and swipe across the top, the backside of your first note and adhere as the base note paper for your booklet. Trust me on this! I thought it would be fun to leave all my images black and white. That way, when I gift these, the recipient can have fun coloring the images, if they wish. 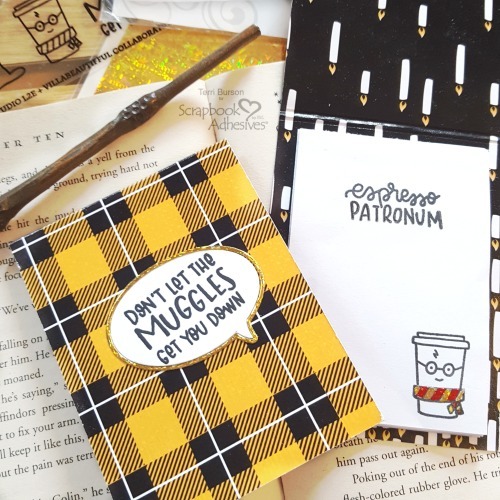 However, I couldn’t resist adding bling to one of those sweet little wizard coffee cups. 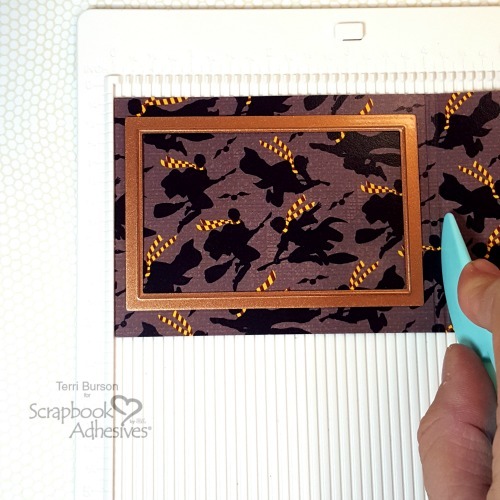 I was already finished photographing this project when I ran to get my red foil from the 3D Foam Creative Embellishment Kit, more gold foil from the Metallic Transfer Foil Sheets Holographic, and Premium Double-Sided Tape 1/8in. 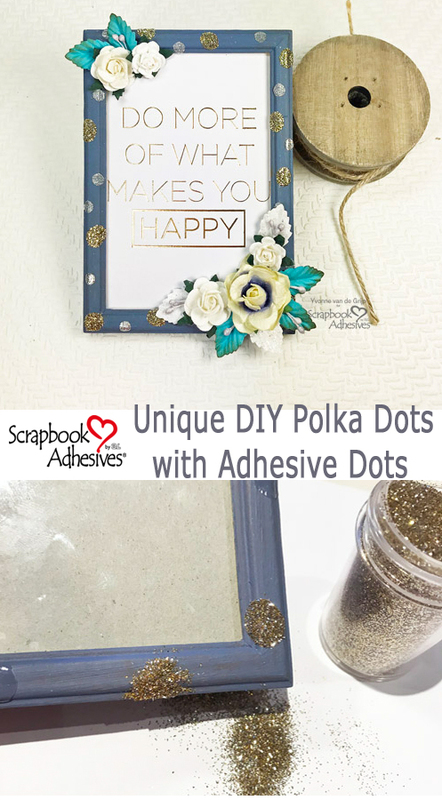 Hi everyone, Yvonne here with a cute and unique DIY Polka Dot Photo Frame…..yep, with lots of glittered Adhesive Dots to Wear Your Adhesive on the Outside on a home decor project! I love framing favorite moments and quotes to put them on display in my home. 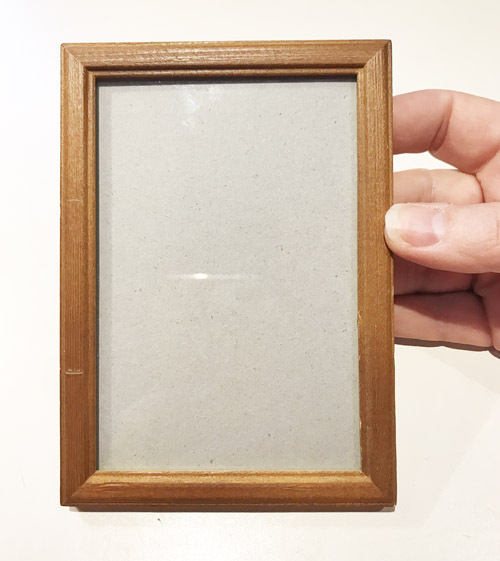 What’s more fun than embellishing some boring photo frame into a unique piece of artwork? 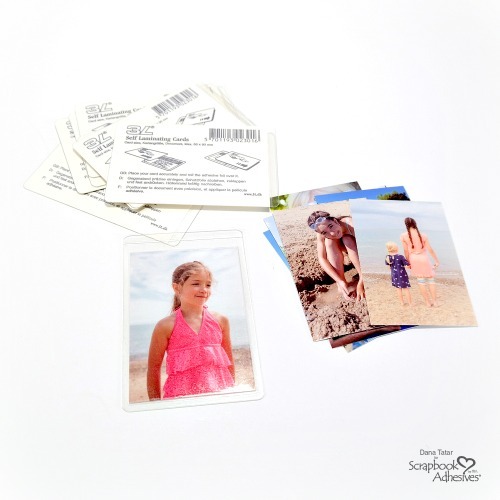 Let me show you how simple it is to create your own unique photo frame. Come on and let’s get started! As you can see, I used an ordinary wooden photo frame bought at a dollar store. But it had a shine or vanish finish so I lightly sanded before painting. Make sure to wipe to get the dust off the frame. 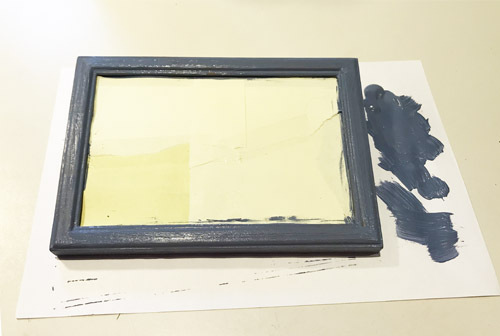 With a brush, I applied a blue-gray color paint on the frame. Let it dry between coats and when the desired color is achieve set aside to dry thoroughly. In a random pattern, I adhered lots of Adhesive Dots Medium Ultra Thin to the photo frame. Once I was satisfied with the coverage, I removed the Adhesive Dots’ clear liners. 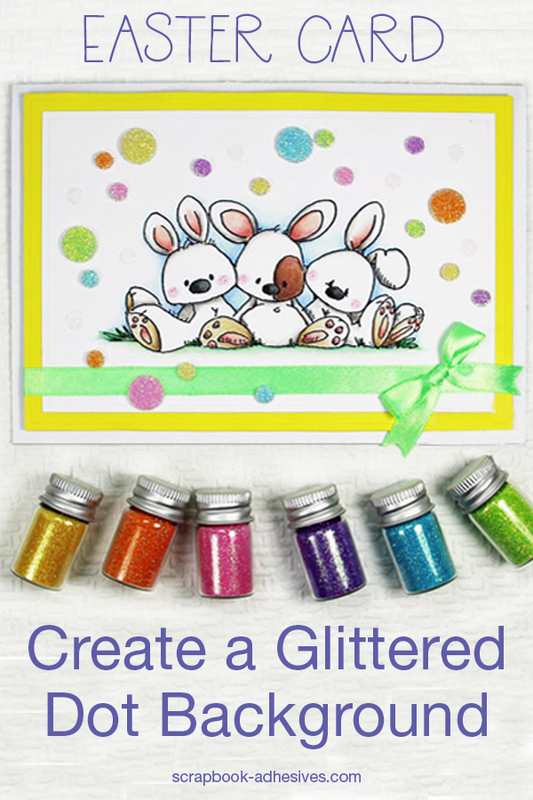 For sparkle, sprinkle gold glitter over the Adhesive Dots Medium Ultra Thin and gently press/rub the glitter with fingers into the Adhesive Dots for extra secure hold. Then tap off the excess. 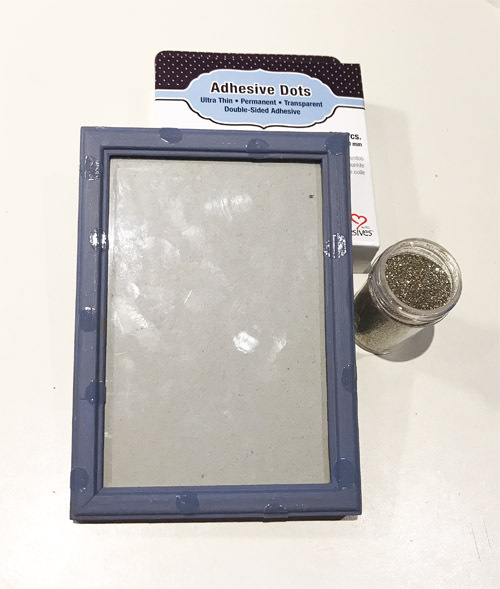 Just to make it more interesting, I dded Adhesive Dots Mini to the photo frame for a fun pattern. When I liked the placement of the dots, I peeled off the liners and sprinkled silver glitter silver on top. Again, pressed and rubbed with my fingers to secure it and tapped off the excess. 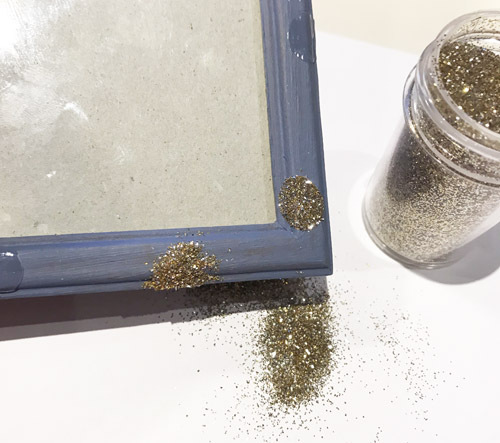 Designer Tip: After tapping off the glitter, use a soft brush to remove any stubborn excess glitter. DO NOT try to blow it off! Not a good idea….now it’s all over my desk and on my face…LOL!!! Place the quote into the photo frame. 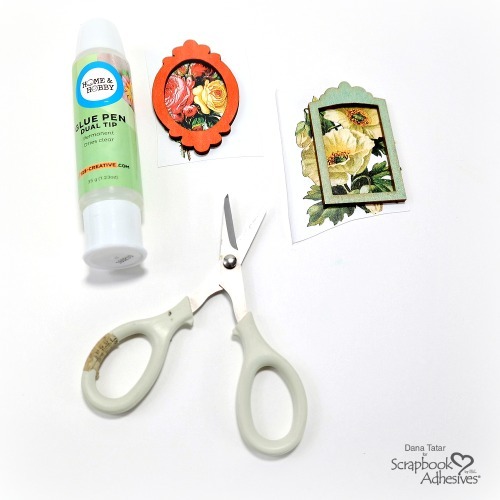 On the upper left corner and lower right corner of the frame, adhere a cluster of mulberry flowers, leaves and stems with the Dual Tip Glue Pen. And just like that, your unique frame is ready to be displayed in your home!